Aoi Zaizen is a character appearing in the Yu-Gi-Oh! VRAINS anime. She is Yusaku’s classmate who attends the same School as him. She is a Charisma Duelist. 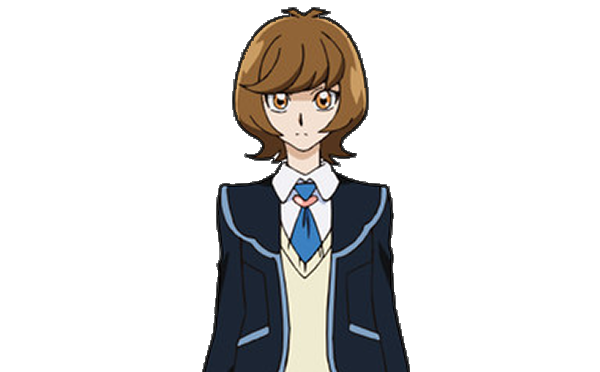 Aoi is a fair-skinned young woman with a bob-cut-shaped light brown hair and yellow eyes.Her standard attire consists of a slate-colored jacket with white trim over a light yellow top which covers a white dress shirt with a blue tie, a short black skirt and black socks and brown shoes. Aoi Zaizen is described as looking quiet on first sight, but is a Charisma Duelist that is very active in Link VRAINS. Aoi Zaizen uses a “Trickster” Deck that incorporates Link Summoning.